80 candidates to judge posts who passed the written and oral stages of examinations that carried out pursuant to transparent and progressive methods started to long-term training course. As continue of works carried out in frame of increasing efficiency of justice in the country, the candidates` training entrusted to the Academy of Justice according to Presidential Decree from 1st October 2009 Year. 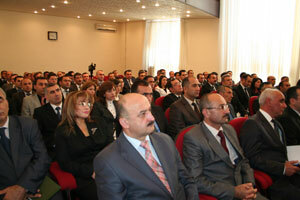 The grand opening of the courses was held on 19th of October. In the first speech of the meeting the President of the Judicial-Legal Council, minister of Justice Mr. Fikrat Mammadov told about realization of successful Judicial reforms that started by National Leader - Haydar Aliyev and continued by the President Mr. Ilham Aliyev, also emphasized modernization of Judiciary, providing Judges independence, strengthen of people belief to justice and simplifying their appealing to courts. Mr. Fikrat Mammadov noted about Academy of Justice importance and its wide-spectral audience as, Judiciary servicemen, advocates, prosecutors and Judges, and informs the audience that these measures taken good in development of justice. In addition, He wished every candidate success during the long-term courses. There should be informing that the course program that will be taught in the Academy prepared pursuant to contemporary methods and international practice. To possession of sufficient knowledge and professional skills of the candidates, the Program were included into actual problems of human rights, the precedents of the Human Rights Court of Council of Europe, deontology, struggling against corruption, novelty of the local legislation. It is decided to organize practical courses in different courts. The lectures of Judges, prominent scientists, and influential foreign experts will be organized in frame of the courses and it is planned candidates passing probation on abroad during courses.